Photojournalist Yuji Nishizaki (Takao Osawa) witnesses the crash of a US aircraft "Midnight Eagle" and together with fellow journalists Keiko Arisawa (Yuko Takeuchi) and Shinichiro Ochiai (Hiroshi Tamaki), they find themselves in the middle of an international hunt for a secret payload- a warhead that threatens to wipe out Japan's entire population. Midnight Eagle is one of the handful films this year that made me feel like bolting out of the theater before it’s over. If you had read our dear webmaster’s review for this movie, it wouldn’t be too hard to guess who his fidgeting movie partner was. Anyway to be fair for this DVD review, I sat down and watch this movie all over again in the comfort of my own home and pace (which might generate a whole lot of viewing experience). As usual, let’s start with the positive aspect of this film. The cinematography and soundtrack music were the first two aspect of the film that stood out. Personally as someone who love the sight of falling snow, this film is packed abundant of it and frankly did entice me to go mountaineering in the snowy mountains. The ambient soundtracks slip in every now and then to set up the mood with the picturesque scenes. If the cinematography and soundtrack music were disassociated with the story concept of this long winded movie and judge purely on those aspects, it would definitely score a 4 stars rating from me. However, the clothes don’t make a man and it stills boil down to the soul of this film and the fault lies in 1) it dragged on for too long, 2) lacked the punch that the film thought it had going and 3) did I mention that it’s too long? With a runtime that is more than 2 hours long, this film would have thrive better with some trimming (even at the comfort of home viewing). The bit with the protagonist’s sister-in-law’s (Keiko (Yuko Takeuchi)) investigation into the hush military matters could have removed and the little discovery that she made could been included in the main mountain expedition with the protagonist Yuji (Takao Osawa). Frankly speaking, her discovery was so minor compared to how the finale was played out, the omission of her bit could easily be written in to the main investigation and wouldn’t affect much. Likewise, the presence Yuji’s son (and his screen time) felt unnecessary and the only reason that it was included was that folks could sympathize with the little boy for the weepy finale. Then there are the multiple attempts to end the movie, the male bonding before the finale and pointless introduction to various military personals that just stretch the runtime even longer than needed. Perhaps the filmmaker felt that all these subplots would create the dramatic tension in the finale but somehow all these subplots never really got to gel together for that purpose. There this hollowness to the emotion that this film tried to muster and after a while it became rather trying experience to watch. (Spoiler example starts) For example a photographer taking picture of his comrade just before they get napalmed? What’s the point in that since it’s unlikely that picture will see the light of the day in the end? (Spoiler example ends). Perhaps it varies from one person to another but personally to see emptily made subplot piling up one and another just fuel discontent for this film. In the end, the viewing experience of this movie at home was much less antagonizing than it was in the cinema. Although the same faults still stood out as per first viewing of Midnight Eagle, the unhurried pace at home that allows pauses and other distraction gave more leeway to those problems. Overall, Midnight Eagle is passable entertainment and recommendable for those who like forceful tearjerker that keep coming and coming. This DVD edition of Midnight Eagle comes with a trailer for this movie. Personally it was a rather spoilerish trailer that movie aficionado should have no problem in picking up what will eventually happen. Check out the trailer after watching the movie. 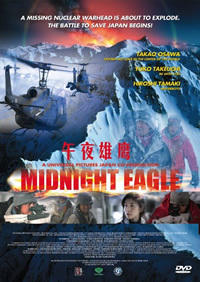 Although in widescreen format, somehow it felt that this presentation of Midnight Eagle was wrongly cropped as some scenes had various characters that are awfully and distinctly cut away from the scene. Otherwise, everything else is crisp and clear (which is good to present the fine cinematography) and the Dolby Digital 2.0 did a fine job in presenting the ever present background music.